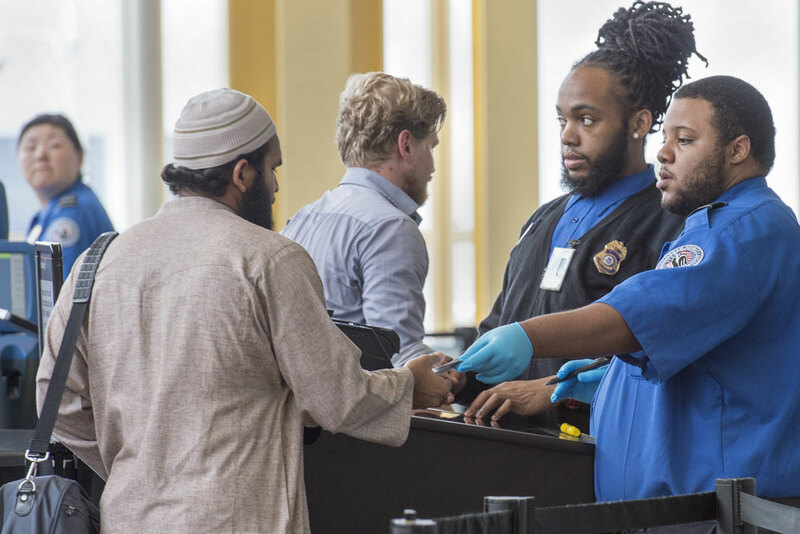 Transportation Security Administration officers inspect an airline passenger's travel documents in Washington, D.C., June 2015. For nearly 16 years, the U.S. Department of Homeland Security’s (DHS) Office for Civil Rights and Civil Liberties (CRCL) has worked to protect individual liberties and the promise of equal treatment under the law. 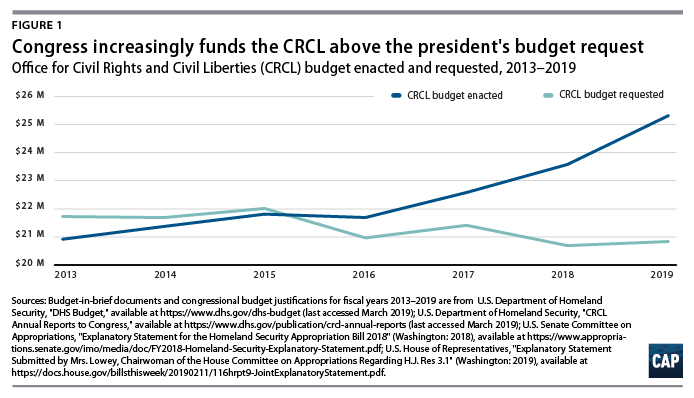 In the face of unprecedented challenges to individual rights and basic constitutional norms that have taken place throughout the Trump administration, the time has come for Congress to re-evaluate CRCL’s authorities, independence, and transparency. Reforms will give the agency better tools to ensure more meaningful oversight and lay the groundwork for the DHS to be both more effective in its security objectives and more respectful of American constitutional values in the future. Throughout the Bush and Obama administrations, CRCL grew to play an important—if frequently circumscribed—role in making the DHS more transparent and responsive on critical issues, including surveillance, disability accommodation, language access, and respect for the rights of arrested and detained immigrants. The Trump administration’s actions, however, have exposed long-standing limits on CRCL’s ability to meaningfully fulfill its mission in the face of political leaders who continuously aim to violate the U.S. Constitution. CRCL’s limitations became abundantly clear in the first weeks of 2017, with the discriminatory travel ban put in place for millions of Muslims, and again in 2018, with the shameful and purposeful separation of children from their parents at the southern border. Authority: Congress should give CRCL clearer statutory authorities with regard to its investigations and policy recommendations, including a clearer requirement that it be involved in policy development; firm timelines for responses to its recommendations inside the DHS; and subpoena power over third parties whose interactions with the DHS are alleged to violate civil rights and liberties. Independence: Congress should ensure that CRCL has independent legal counsel and sufficient operational independence within the DHS. CRCL should also have reporting authority over civil rights officials inside each of the DHS’s main operational components. Transparency: Congress must demand that CRCL be more transparent with people who file complaints with the office and ensure that it can make meaningful, independent reports to Congress and the public on its activities as well as the DHS’s responses to its recommendations. The challenge for Congress may not be to ensure that CRCL can stop the next family separation crisis but to give it the authority and tools it needs to play its best role in more ordinary cases. And, just as importantly, Congress should ensure that the office can at least effectively sound the alarm within the department as well as for Congress and the public in those more extraordinary circumstances. The Center for American Progress recognizes that no obscure policy office would be able to stop a DHS secretary who is bent on adopting child abuse as a government program or defying the plain language of the asylum statute.30 CAP therefore focuses on ongoing, institutional problems that predate the current administration and would remain under its eventual successors. Experience has shown that with its current statutory authorities and structure within the DHS, CRCL suffers from the following shortcomings and limitations. Whether the issue is a failure of other policymakers to appreciate the civil rights dimension of a problem—as can frequently be the case when it comes to accommodating disabilities or language needs—or an intentional choice to exclude civil rights experts from decision-making processes, the result is the same: CRCL is left out of the loop. A similar problem has been addressed through the Privacy Act of 1974 and the E-Government Act of 2002, under which agencies are required to regularly perform a privacy threshold analysis to determine whether a record system requires privacy analysis—and if so, a privacy impact assessment to determine privacy risks and mitigation steps.35 CRCL has no equivalent process to force component agencies to surface or disclose impending policy decisions with a civil rights or civil liberties dimension. Clearer statutory language setting forth CRCL’s need for information and to reach an ultimate resolution would give the office the tools it needs to address these shortcomings—as will a clearer expectation that CRCL will report to Congress and the public when it has and has not been given an appropriate seat at the table in DHS’s most important conversations. CRCL’s transparency needs to be greatly improved. As it stands now, neither the people and organizations that file civil rights complaints nor Congress and the general public can glean a clear understanding of CRCL’s effectiveness or where the DHS is freezing it out. In 2019, Congress directed CRCL to ensure that complainants receive more information within 30 days of the end of each complaint investigation. If history is any guide, however, the DHS will continue to shield meaningful information about complaint outcomes behind claims of deliberative-process and attorney-client privilege notwithstanding this provision.42 While privacy issues limit what CRCL can make available to the public, Congress could require CRCL to send confidential copies of all final recommendations to the relevant congressional oversight committee. A report on preventing suicides among individuals in U.S. Customs and Border Protection (CBP) custody stated: “Our subject-matter expert drafted an expert recommendations memo for CBP and Border Patrol … CRCL will also work with CBP to implement our expert’s recommendations to the greatest extent possible.”46 What suicide risks were present in CBP custody—and the recommendations to prevent them—were not discussed in the report. Summaries such as these do not convey whether CRCL truly identified a civil rights problem or whether the DHS responded or stonewalled the office. Other statutory language requires that CRCL regularly report “the type of advice provided and the response given to such advice.”49 A review of these reports makes clear that CRCL is not reporting—or the report’s reviewers in the DHS secretary’s office or the Office of Management and Budget (OMB), as discussed below, are not allowing it to report—circumstances in which its advice is disregarded or excluded from policy development. Again, no instance could make the problem clearer than the lack of any reference being made to CRCL’s exclusion from the implementation of the Muslim travel ban in the office’s report from that year. 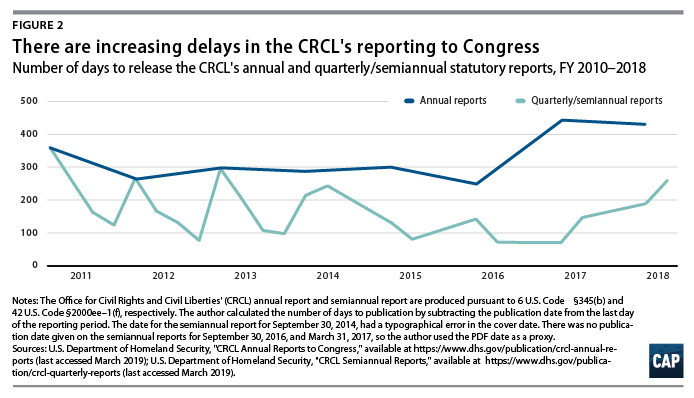 These delays in reporting are attributable to many causes: delay by DHS component agencies in responding to CRCL; arguments about the application of privileges to prevent disclosure; and the agonizing clearance process by which the reports must be approved by CRCL, DHS’s attorneys, the DHS secretary, and the OMB. As a consequence, there is diminishing reason for complainants to have faith that CRCL’s investigations are producing better observance of civil rights and civil liberties. CRCL’s statutory mandate includes “oversee[ing] compliance with constitutional, statutory, regulatory, policy, and other requirements.”53 These functions essentially concern legal issues: determining whether a proposed ICE enforcement action or U.S. Citizenship and Immigration Services (USCIS) adjudication policy abides by a constitutional or statutory requirement is a job that should be done by a lawyer. While nearly all senior CRCL staff are attorneys, under DHS rules, they are not functioning as lawyers in the sense of providing legal opinions or working in an attorney-client relationship. This barrier is particularly acute when issues involve litigation, as is the case with many immigration issues. With the same counsel handling DHS’s litigation load as advising CRCL, there is little appetite to create records that could haunt the agency in later litigation discovery. The result is an inversion of CRCL’s intended role: Rather than heading off civil rights problems, it has to be kept away from them for fear of substantiating a violation for which the DHS might later be held liable. The solution to this problem is for CRCL to return to a status with independent legal counsel, giving it the means to stand up for itself in both legal analysis and internal legal arguments. For years, CRCL has been held out as the DHS’s shield against racial profiling, particularly in the Secure Communities and Priority Enforcement Program (PEP) immigration enforcement efforts, which examine fingerprints that state and local law enforcement collected to identify individuals amendable to deportation proceedings.57 But as CRCL has elliptically reported, even when the DHS secretary charges the office to “monitor state and local law enforcement agencies participating in” immigration enforcement, those investigations are hampered by the fact that CRCL itself has no ability to obtain information from nonfederal entities. This lack of authority to subpoena documents or interview witnesses at local law enforcement agencies involved in programs such as Secure Communities sharply limits CRCL’s ability to conduct meaningful investigations of cases where ICE or CBP has collaborated with local law enforcement on a possibly unlawful arrest. In particular cases, CRCL may have a statutory power to request documents under Title VI of the Civil Rights Act of 1964.58 But its general lack of third-party subpoena power is particularly striking in comparison with many other oversight agencies across the executive branch, including the DHS Privacy Office.59 Even if the power were seldom used, possession of such a power would enable CRCL to ensure that third-party agencies took its questions seriously and were prepared to cooperate more fully in civil rights investigations. In 2017, Congress considered addressing this problem by requiring each DHS component agency to appoint a career civil rights and civil liberties officer, who would “serve as the main point of contact for” and “coordinate with” CRCL.63 The bill died in the Senate in 2018. The concept, however, should be revived so that civil rights professionals, with an ethos that reflects constitutional values and a policy alignment with CRCL,64 have a voice in real-time decision-making in each of the component agencies. Almost all of the structural issues noted above could in principle be addressed through management action by the DHS secretary.65 In light of 16 years’ experience of DHS leadership resisting a more transparent and effective role for CRCL, however, the best course of action would be for Congress to shore up CRCL’s statutory authorities in 6 U.S.C. § 345 in several critical ways. At all times, CRCL should have clear statutory authority to access all policy documents that could pertain to its mission. This would include the kinds of documents that have been withheld in the past, including decision memos for the secretary and leadership of the component agencies and legal memos produced by the various legal offices within the DHS. CRCL should be included on any document clearance process that includes the DHS Office of Policy, whose central role in policy development is respected. The senior civil rights officials in each component agency should also have the same authority within their respective domains. Any deviation from these information-sharing obligations should require the personal decision of a senior appointee such as a component agency head or the deputy secretary. CRCL should create a civil rights and civil liberties threshold assessment tool akin to the privacy threshold assessment that would be a routine part of policy planning throughout the DHS and its component agencies. The threshold analysis would identify issues calling for further analysis prior to proceeding. This would serve to ensure that polices with civil rights or civil liberties dimensions are identified early on and allow for expert advice at early planning stages. Where CRCL has obtained information through one of these channels, it should be empowered to make recommendations; receive a timely and concrete response from the affected agency; and escalate disagreements with component-agency leadership for ultimate resolution by the DHS secretary. These operations should be backstopped by an effective reporting process, discussed in greater detail below, so that officials understand that CRCL will be obligated to report on the number and nature of cases where its recommendations are and are not accepted. Timelines for component agencies to give responses to CRCL’s investigation requests and final recommendations should be fixed and respected. Congress should make clear that it is appropriate for CRCL to recommend, even where it cannot require, remedies in individual cases. For example, when a racial-profiling investigation confirms that improper policing likely led to an immigration arrest, CRCL might recommend that ICE or CBP exercise prosecutorial discretion to discontinue immigration charges arising from the unlawful arrest. These remedial recommendations should also be strengthened by a requirement that CRCL’s recommendations and an agency’s response be reported to Congress and, to the extent possible, the public. CRCL should have the same third-party statutory subpoena authority as the DHS Privacy Office and many other executive branch oversight bodies. The role of CRCL chief legal counsel should be revived with a good deal of operational independence from the Office of the General Counsel at DHS headquarters—and possibly with a reporting relationship through the legal department of the OIG—and be as independent as the chief counsels of the operational components. The DHS general counsel’s ability to preclude CRCL from an area of inquiry should not include general overlap with a subject matter of active litigation. While the interaction between internal oversight and litigation is necessarily complex, CRCL and DHS counsel should be directed to arrive at workable guidelines that do not unnecessarily sacrifice CRCL’s ability to be effective. As proposed in the 2017 DHS reauthorization bill, each of the major operational components should have a chief civil rights professional.66 This official—and any office under her—should follow a dual reporting structure that is responsive to both the head of the component agency and the CRCL officer—the structure followed for many other lines of business within the DHS such as IT. The CRCL officer therefore needs substantial input into the hiring and firing of such officers as well as the routine exchange of information and staff resources to ensure that a culture of respect for civil rights and liberties can be fostered throughout the DHS. CRCL’s annual report should be independent and not a report of the DHS secretary that is cleared by the OMB. Congress should apply the statutory independent reporting language that the DHS Privacy Office and Office of the Citizenship and Immigration Services Ombudsman have to CRCL as well. Congress should also clarify its expectation for the timely filing of the report, for example, at no more than 90 days after the end of each year. Congress should require that all final recommendations made in writing by CRCL—whether in response to a policy initiative or a complaint investigation—be made promptly available to the congressional committees of jurisdiction, with suitable accommodations made to protect sensitive personal information. CRCL should strive to provide significantly more information to individual complainants than it does now. The 2019 Committee on Appropriation’s explanatory statement that CRCL provide timely responses to complainants should be made permanent. CRCL should be directed to provide, in redacted form as necessary, copies of completed investigation reports to complainants. In doing so, Congress can clarify that the DHS is not to hide CRCL’s completed work behind deliberative-process privilege, attorney-client privilege—as to findings of fact, which cannot be privileged—or a component agency’s failure to give a final concurrence or nonconcurrence with the recommendation in a reasonable period of time. CRCL has proven a worthwhile experiment in internal oversight and policy governance in a domain where other forms of oversight—whether congressional or judicial—can lack the speed and expertise to provide real-time input and guidance. But the Trump administration’s assault on civil rights, civil liberties, and other constitutional norms has made existing weaknesses in CRCL’s mandate and functioning clearer than ever. Now is the time for Congress and the DHS to revisit its authorities, independence, and transparency, providing more effective oversight now and creating a better foundation for the DHS to abide by its obligations in the future. Scott Shuchart is a senior fellow at the Center for American Progress. From 2010 to 2018, he was the senior adviser to the Officer for Civil Rights and Civil Liberties at the DHS, where he worked extensively on immigration enforcement, detention and custody, and border security, with an emphasis on data-driven analysis to identify civil rights and civil liberties violations. While at the DHS, Shuchart led efforts to ensure that ICE’s Secure Communities initiative and other programs respected civil rights and avoided racial profiling. Prior to joining the federal government, Shuchart was a litigator at Altshuler Berzon LLP in San Francisco and Boies Schiller and Flexner LLP in New York. He then taught at the Yale Law School’s Supreme Court Advocacy Clinic from 2008 to 2010. From 2003 to 2004, Shuchart clerked for Judge Marsha S. Berzon on the 9th U.S. Circuit Court of Appeals. The author would like to thank Margo Schlanger for her ideas and analysis and Tom Jawetz, Phil Wolgin, and Silva Mathema for their contributions to this report.